The World Academy for the Future of Women (WAFW) leadership program is a bold and rigorous training initiative for young women students committed to acquiring skills and confidence to develop as campus, community, national, and eventually global leaders. These young women found a focus on emotional intelligence played a big part of how they evolved and developed as leaders in the nine-month program. Supported by a grant from Six Seconds, The Emotional Intelligence Network, and the commitment of network member Angie Wong, the WAFW participants had the opportunity to experience the Six Seconds Emotional Intelligence Assessment and EQ training program. The Six Seconds EQ toolset helped the 87 young women at the Sias University in Henan, China to become more aware, more intentional and more purposeful with their emotions. Through facilitated curriculum, dialogue, and interactive programs, the young women students are prepared for leadership roles in the new economy as global citizens. Team projects based on the United Nations Millennium Development Goals are the centerpiece of the WIFW program. Together with other volunteer facilitators, Wong provided the Six Seconds assessments and training to compliment the other components of the WIFW curriculum. As a result of the EQ work, these WAFW women had a greater understanding of their own emotional intelligence competencies and were able to apply what they learned in building the capacity in influencing others. By developing more clear self-awareness and practical tools for becoming more masterful with their own emotions and reactions, they gained much more confidence as leaders and were able to apply their EQ strengths for personal and team effectiveness. Firstly, in the past, I am timid, even when answering questions in class, I will be shrinking. I am scared to speak in public and am not comfortable of who I am. I am overly concerned with how others think of me. I am nervous about who I am. I feel unhappy. I know nothing about the feelings. I think they are just feelings and let them control me. When I am angry, just yell out at others and regret what I have done later. What’s worse, I am so easy to lose my temper. I think we can do nothing about our nature. I don’t care about the outer world. I only focus on my trifles around me. I think I am an ordinary person, a female, and I can do nothing about the world. What I need to do is to live my life. Other things are not my business. I am selfish. Finally, I used to be living a life without thinking. I have no idea about my future, my life, my direction. Just live one day and the other day. I don’t like to communicate with others. I have no interests to explore people, life’s meaning and others things. I am a person who doesn’t recognize her soul and the meaning of life. Now, I am confident and finish my presentation successfully. I know confidence comes from sufficient preparation, self-awareness and self management. I am happy that I find myself. I have the confidence and courage in my heart. Sometimes I am a little afraid. But it is OK, I think. I can control it well. Confidence helps me find a life. I know the skills of controlling my feelings. I don’t escape from the condition. I face my feelings, analysis them, and work through my negative feelings. I am more skilled in responding to my feelings when I get influenced negatively. I wake up my conscience and build universal love. I learn that all of us have challenging situations that create sufferings in us. We are humans and we should care about each other. Helping others is also helping me. It is like paving a road, and then you can walk smoothly. Only when you help others, and you spread this spirit, then you can receive others’ help when you are in trouble. Nobody is lucky all his life. Finally, I start to think now. Even though I don’t figure out until now; life is complex as it is. Maybe the life’s meaning is the process to find the answer itself. I am on my way. Increased self-awareness, with recognition that we all have feelings, and that these affect our choices. Increased self-management, including using emotions as a source of important information. Increased self-direction, articulating a larger vision and increased commitment to create positive impact. Given the success of the program, WAFW is continuing this effort. Six Seconds has extended the grant to the World Academy for Future Women to provide assessments and support for their 2011-2012 program. For more information about The World Academy for the Future of Women, see www.globalinteractions.org. Angie Wong is a volunteer facilitator, and a member of the Six Seconds Emotional Intelligence Network. She lives in both Hong Kong and the US, and her mission is to support women leaders in Asia, for more information, see Angie’s profile. Six Seconds is a global organization supporting people to create positive change and increase people-performance. Founded as not-for-profit corporation in the US in 1997, the organization is now led by offices in 10 countries. Six Seconds’ change agents work to improve leadership, collaboration, and effectiveness in every sector. The organization gives a limited number of grants to educational and community programs to provide powerful emotional intelligence assessment and development tools to support positive change. Visit www.6seconds.org for more. Josh, this is really fabulous ! Kudos to Six Seconds and looking forward to assisting more and more people and children to live better, more fulfilled lives ! I am blown away! How thrilling and inspiring this is. I love how these women so beautifully expressed their transformation throughout the program. I’m grateful to be part of our Six Seconds’ network, supporting this effort. Angie–wonderful, wonderful!! I so agree, Susan – their comments are touching and powerful. Imagine what happens when hundreds of young women share this transformational journey. Go Angie! Fantastic, Josh — CONGRATS to you all for working with such an important topic! No other topic I know of is more PRACTICAL, affecting us both academically and personally! What a blessing these young ladies are receiving from Angie Wong and Six Seconds. The expressions of confidence, strength and excitement of understanding one’s purpose will serve these women well. Thanks Wanda – and Matt & Sanjoli. Angie and the WAFW team are doing something really special here, and I’m glad Six Seconds can support this work. Wanda, I like the phrase you used, “excitement of understanding” — there is power, this focused human energy, that is unlocked from learning… and even more when it’s learning that ignites an awareness of purpose. World changing! WOW!! Shui’s and Lee’s examples are classic examples of positive transformation!! It’s Amazing to read your comments, I feel I am one of them too, though I am not connected to WAFW. Specially One Angie or one Joshua is needed, I feel fortunate and yet blessed to have you Josh as our facilitator. I too liked the categorization made by you as self awareness, self management and self direction Wow it’s simply amazing. Thanks Josh for sharing. Today itself, I experienced this in one talk I gave on farewell of Vice Principal, I thought Whatever I will speak; I will speak but mindfulness is very important and I did it. Hi Arati – they make it so visible, don’t they? Thank you for sharing your comment — and for continuing to spread EQ! I feel grateful for the EQ work and feel blessed to be in the six seconds EQ network and this community. Joshua, you are truly an inspiration. I aspire your deep caring and the contribution you are making to support others to live in their best self. 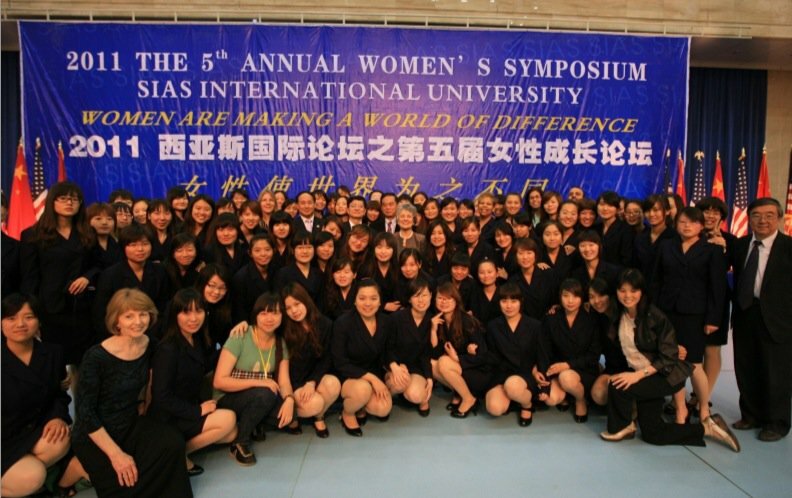 Thank you for your generous support to the world academy for the future of women (WAFW) in China. On behalf of the young women leaders, I express their sincere gratitude. I will never forget their smiles and their tears of pride as they get acknowledged as a WAFW graduate. The EQ work had made an impactful difference in these women’s lives. For that, I am most grateful. Angie – as this project shows beautifully, it is easy for me and Six Seconds to support positive change in the world… when we are connected to people like you who are living your Noble Goal. So, thank you for the appreciation, and it is mutual! I am so proud of the young ladies that take the time to develop their leadership skills. Having spent time at SIAS University in China and reinforcing the six second EQ skills into the program for the World Academy members I do believe that they will be better prepared for what ever it is that they are interested in pursuing. I wish to thank Six Seconds for providing these tools for this program! Phenomenal! Excellent initiative Angie! I am sure every one of the 87 students has an equally powerful testimony to share. Bravo Josh and the Six seconds team! Your support through the grant system and the your personal committment is very inspiring. Way to go!!! I believe that your program to young women in China is very interesting. With many of the beliefs and customs which have been forced externally by their present political, cultural, and educational systems, ie, forced customs of limited family size, that the value of a male child over a female is different, etc. the training of these young women to believe in themselves as valuable persons with a Destiny is profound. Hi Kaleigh, you raise an important point about this work – and something I’ve found incredibly powerful in Six Seconds’ approach. We are not an organization that takes an idea from one country and “exports” it, imposing it on other cultures as “the way/” We have a process for supporting people to tap into their own wisdom – the participants are the experts… and because we are led by people from 10 countries, we’ve found some fertile common ground in which this inner knowing can be cultivated. Yes, I like that approach. Thank you for this beautiful personal engagement towards the younger ones. We should always reach for the next generation, they look up to us and need our approval and encouragement in their effort to empower themselves.